This cake for a holiday crowd always draws raves . . . particularly after it’s cut and partygoers get a peek at the color inside. You can play around with your own color scheme for decorating this cake. Make a Christmas tree cake for you holiday party. Keep the borders and edges free of any decoration so that the eye is drawn directly to the tree that appears to be standing amidst beautiful, fluffy snow. After you have baked your red velvet cakes, let them cool in the pan for 10 minutes before inverting onto a cooling rack. When they are completely cool, apply a crumb coat (thin layer) of cream cheese frosting. Refrigerate for 1 hour. Divide and tint the frosting as follows: 2 cups leaf green and 1⁄2 cup brown. Frost the cake with the remaining untinted cream cheese frosting. 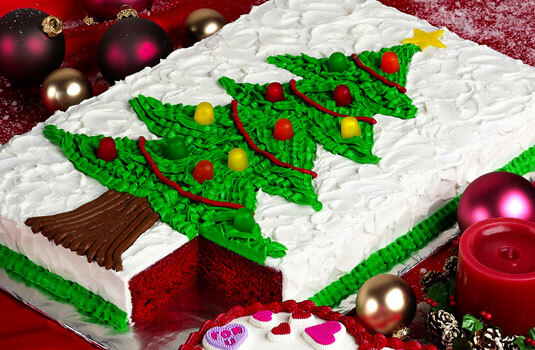 With a bamboo skewer, sketch the shape of a Christmas tree on the surface of the cake. The tree trunk should be 3 inches tall. Outfit a pastry bag with a coupler, #11 tip, and brown frosting. Pipe the trunk in straight lines. If desired, smooth out the piping with an icing spatula. Place the colored gumdrops on the tree, arranging them to look like ornaments. To create the star, roll out a yellow gumdrop. Either carve out a star shape with a sharp knife, or cut the rolled gumdrop into five triangles and form them into a star. Place the star at the top of the tree.